After loving Han’s Summer trilogy, I’ve been wanting to read everything else she’s written, and this one was one that I was anxiously waiting to read! I wasn’t sure what I was expecting exactly. Don’t get me wrong, I really liked it, but it took me a while to get into the book. There’s quite a bit of set-up, so you know what’s going on, and why the letters get sent. In a lot of ways, I think I was expecting the nostalgia that I felt with her previously mentioned series, and while there are some similarities, it’s also a different book. I know the letters are what spur a lot of the events in the book, but I really expected more with the letters. I really thought they’d be huge. Them getting mailed was big, of course, but…I don’t know, I just expected something more with them, that’s all. I thought Lara Jean was interesting- it very much seemed like her sister took care of so much after their mother died. Lara Jean did too, but it really felt like Lara Jean couldn’t do anything without Margot sometimes. I did like seeing her try to figure things out herself, and how she and Kitty did some of their annual Christmas traditions without Margot. I get Margot maybe feeling a little hurt or left out…but I kind of also liked seeing them with her. There was a point where Lara Jean and Josh were super-irritating, and it was Peter who acted pretty realistically during that whole thing. Lara Jean seemed super-innocent (which I can relate to) and I understand why she acted the way she did (same with Josh but to a much lesser degree) but I still felt like it was a bit excessive. Also, her friendship with Chris didn’t make a lot of sense to me- and considering they were best friends, I kind of expected something more with their friendship. I wasn’t a big fan of the drama in it. Sometimes, I don’t mind drama, but I guess I wasn’t in the mind for it with this book. And while I plan on reading the sequel, I’m also not sure about it. I feel like this book stands on its own really well, and with an extra chapter for closure, I think it would have been fine without a sequel. 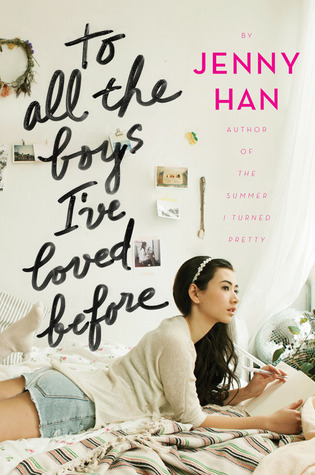 But I love Jenny Han as an author, so I’ll definitely be giving it a chance. It is why I kept going with this book, even though I wasn’t sure about it at first. Even though I wasn’t sure about this book at first, I did like seeing the letters and what happened as a result of Kitty mailing them. It was pretty obvious early on who did it, but I liked seeing Lara Jean deal with all of the Peter stuff and Josh stuff, and how her relationships with her sisters changed (even though I wanted more resolution with Margot because I felt like we got none). It is a cute, sweet book and I liked that it was all about crushes! I wish that letters were more of a thing in the book, and I felt like it started off slow, but it did become what I’d expect from a Jenny Han book. To All The Boys I’ve Loved Before gets 4 stars. I didn’t like this book as much as I thought I would, but it was pretty cute and I’ll be reading the next book, too! It is a cute book!